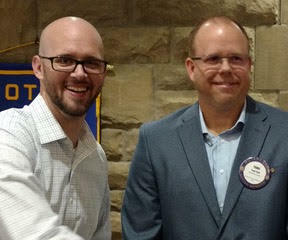 Dan Willis was inducted into the Rotary Club of Granville on March 18. Dan (pictured at left) is a wealth advisor for Centricity Wealth Management in Westerville and believes that his contributions to our club could come in the form of building relationships with leaders. In his free time with his family — wife Jamie and children Nolan, 3 and Emmerson, 1 — he enjoys camping, hunting, and reading about history and economics. Dan was sponsored by club Membership Director Todd Belt (pictured at right).